If you have sensitive documents in your home and you're worried about them being lost, stolen, or damaged, you can keep them safely protected offsite by getting a safety deposit box at your neighborhood bank. Safety deposit boxes are tiny storage units in banks and credit unions. They keep important documents, as well as other valuables, safe and secure. The main benefit is security. Safety deposit boxes are located in secure areas that are generally more resistant to fire, flooding, hurricanes, tornadoes, earthquakes, and other natural disasters than most houses. Let’s not forget burglary. If important papers are left in a small home safe or filing cabinet, it is easy for the items or even the entire box to be removed. Not only do your valuables go missing but possibly also the paperwork that will help sort it all out, such as serial numbers and documents to prove your loss or even your identity. Numerous safety precautions protect your safety deposit box. Banks generally verify signatures and identities of anybody who requests access to the box. Handing your key to someone else or sending somebody with the power of attorney to act on your behalf will typically not work, but check with your bank to verify its procedures. If you want anybody else to have access to your box, visit the bank and complete any paperwork with that person well before they need access. Safety deposit boxes are located in secure areas with alarms, video cameras, and high-security locks. In most cases, a bank employee must be with you to retrieve the box. Each box should require two keys (yours and a bank employee’s), and the most secure boxes are in separate areas, away from the bank entrance. Along similar lines, you’ll also enjoy privacy. You might not want important information and sensitive documents in your home. A safety deposit box prevents roommates, children, relatives, and anybody else from going through your belongings. At many banks, employees who help you access your box will leave you alone in a private room to open, close, and sort through box contents. At one time, a safe deposit box was the best way to store valuable documents, and there are still few good alternatives for storing original documents and valuables. But what if you just need copies? You might be able to meet your needs by storing electronic copies with an online service or keeping encrypted storage devices (like USB drives) in multiple locations. Private vaults are another option for physical storage. These nonbank businesses offer safe deposit boxes that are often available 24/7, and which promise more privacy than banks. The convenience might attract you, but you’ll need to evaluate for yourself if your box will be secure. Remember that others also have 24/7 access, and they might be unattended in the same room as your box. The cost of a safe deposit box depends on the size. Prices can range from $25 per year for a small three-by-five-inch box to $125 per year for a larger ten-by-ten-inch box. Other costs can be incurred, such as late payment fees, drilling fees if the key is lost and you need the contents quickly, and fees for replacement keys. If you just need to store a few documents and they can be folded, a three-by-five box is probably fine (many boxes are 12 to 24 inches deep). In some cases, the rental fee might be tax deductible. Ask your tax preparer. Safe deposit boxes are good for small, important, and valuable items (including documents) that you want to protect. These should also be items that you don’t need readily available at your fingertips. Your documents are safe in a safe deposit box, but they’re also inaccessible. So make sure you have a plan for getting any time-sensitive documents when the bank is closed or the box owner is incapacitated. Depending upon laws in your state, if you rent the box in only your name, don't keep items inside the box that your heirs would need, such as your trust, will, or other documents. Passports: Things happen. Not only emergencies but spur-of-the-moment situations that require travel. Remember that the important documents are stored in a business that might only be open from 9 a.m. to 4 p.m.
Wills (check with an attorney about originals or copies): Laws vary from state to state, so you’ll need a local attorney to tell you where to keep originals and copies. If the original is locked up, some states require a court order to get into the box, which delays everything and costs money. 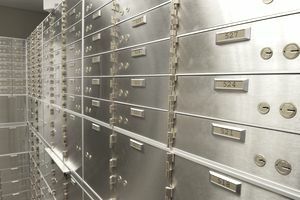 Other states make it easier for family members to access safe deposit boxes. Medical care directives: Loved ones should not have to make possible life-and-death decisions without written guidance. Inform your loved ones of any arrangements you’ve made, and do not leave the only copy in a place that may be inaccessible to them. Funeral or burial arrangements: If it is difficult to get into the safety deposit box or nobody knows that you’ve already made arrangements, the process can be more painful for friends and family. What’s more, what you want and what your loved ones think you want may be two completely different things. Power of attorney (POA): This document gives a designated representative the right to make certain decisions for you. It does not do anyone any good if the only copy is locked in a box while you’re incapacitated. One solution is to make your POA a co-renter. Keep in mind that many financial institutions will not accept a “generic” power of attorney because they cannot verify if it is still in effect, if it was written while you were competent, or the extent of the POA’s powers. Work with each financial institution individually (using their forms) to set things up properly. Cash: Cash in safety deposit boxes is not insured by the Federal Deposit Insurance Corporation (FDIC). The FDIC insures up to $250,000 per depositor per bank, but only covers money you’ve deposited in checking, savings, and CD accounts, for example. FDIC insurance does not cover items in a safety deposit box. Jewelry and rare and collectible items (that you want to insure): Again, not FDIC insured. Check your homeowner's or renter's insurance policy to see if safe deposit box contents are covered. Some insurance will cover theft, loss, or damage, and your insurance company might also offer a lower premium since the items are more secure in a safety deposit box. Other policies do not cover anything. A safe deposit box might ensure that only you can access the contents, but someday your life will end or you’ll be incapacitated. Make a plan for those inevitable events. Maybe somebody should know about the existence of your safe deposit box, although not necessarily the contents. If you want the box to be opened shortly after death or incapacitation, consider adding a co-renter (only if it’s somebody you trust because they can access the box at any time) or making arrangements with your bank. You might be able to appoint a deputy or agent who is authorized to open the box under certain conditions. Public Wi-Fi Is Handy, But Is It Too Risky for Online Banking?